Basic Yoga Poses done on your Bosu Balance Trainer adds a whole new dimension to your body-mind-soul movements! 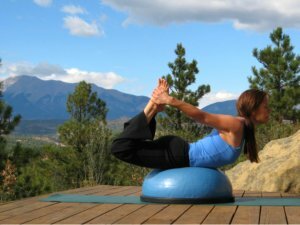 These yoga poses on the Bosu Ball truly are movements of the soul. I couldn’t believe how much this little trainer changed my experience when I the yoga poses on it! 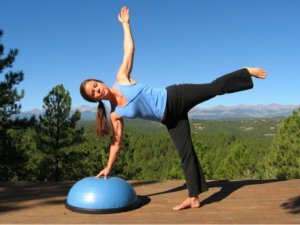 While doing Yoga itself is a wonderful body balance exercise, adding the element of balance on the Bosu Ball while doing the basic yoga poses was quite a challenge. 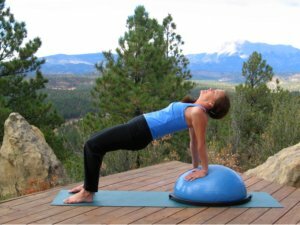 The many small muscles of your core that are engaged while balancing will really up your game. I offer my personal yoga experience on this balance trainer, knowing that the poses were twice as difficult, my form was twice as bad, but the experience was twice as wonderful! So join me and let’s journey forward as we uncover more body window secrets regarding our body-mind balance and how it affects our lives. Let your mind go, and feel the movements as you connect with your body’s inner wisdom to help you balance your life and heal your body-mind-soul! Access those hidden sensations tucked away inside you, feel your body’s special perceptions and find your Inner Power at the very core of your being. 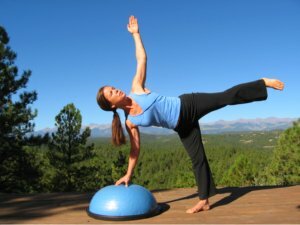 In addition to being great balance training exercises, all the basic yoga poses I do on the Bosu Balance Trainer are great strengthening exercises and great flexibility exercises. 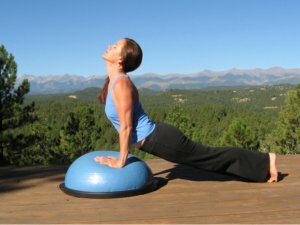 Your Bosu Ball is a great little trainer for overall fitness that can really help you start your body-mind-soul process. What would basic yoga poses be without the Yoga Downward Dog? With the elevation from the Bosu Ball, you might actually be able to touch down on the floor with your heels! It may be a first! This yoga pose is one of the easiest on the Bosu. Another basic yoga staple is the Upward Dog. You may try to rest on the tops of your feet if you feel so inclined. My deck was too hard to do it in this photo! 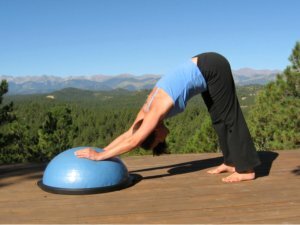 When you do the Bow Pose on the Bosu Ball, it will really strengthen your core, both front and back. If you have back pain, go easy on this one to see how you do. 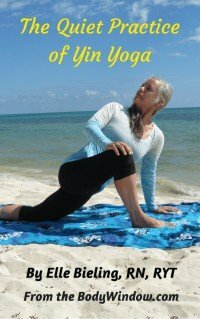 If your back is great, this basic yoga pose will keep it strong. The Plank Pose feels so much less stable on the Bosu Ball. It is a huge strength move for your chest and biceps. It also requires strength in your core - abdomen and back. The Reverse Table Pose, also a great strength and balance exercise, will strengthen your jiggly triceps and really stretch out your biceps. Believe it or not, these are not the most intense yoga poses for arm strength on the balance trainer. There are even better ones in my article, Bosu Balance Trainer Overall Fitness Strength Training. So start working on these to tone your arms and start your balance training. 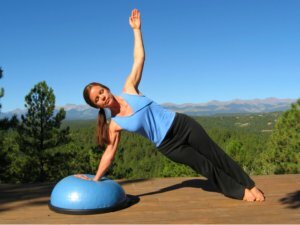 More of a pure balance training pose is the Yoga Half Moon Pose, however, beware, that done on the Bosu Ball brings a totally different perception. You are sort of using it as a yoga block, however a very unstable one! You can make this exercise even more difficult if you turn you head up. The Side Plank Pose requires a lot more strength than when done on the mat alone. Go deep to find your center for this one. Find that inner Strength that I know you have. Turn your head upward to make it even harder. Remember that balance training is about using your right brain. It is the right brain that processes the special perceptions and body awareness required to balance. So in the next balance exercise ask your feeling brain to help you as you focus on your body-mind balance and let go of your left brain. This is why when you do body-mind balance training, that you feel so good afterward. You are giving your left, overactive brain a real rest as you tap into your soul. As I always like to say "There is real freedom in movement." Because of this freedom, there is also healing in movement. Try the Yoga Fierce Pose and the Revolved Fierce Pose. These are fun, and will greatly strengthen you jiggly thighs. Close your eyes to make it harder. I can’t do it, so there’s no photo. But I am working on it. My eyes may look closed, but they are open slightly. 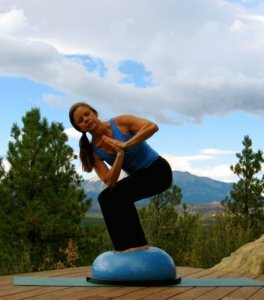 This is a very difficult standing pose on the Bosu. Next, let’s do the Yoga Standing Forward Fold, one of my absolute favorite basic yoga poses for grounding and strength. 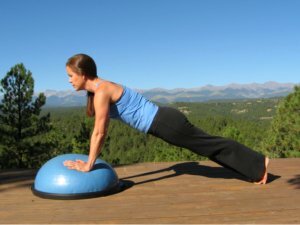 Although you won’t feel very grounded doing it on the Bosu Ball. You’ll feel quite wobbly, but it is very doable. I promise! This is an easier standing balance pose than the Fierce Poses. And finally, let’s end it for now with the Yoga Tree Pose. 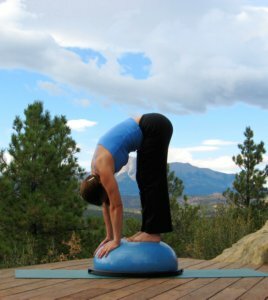 This basic yoga pose is really hard on the Bosu Balance Trainer, and as you can see, I could barely do it. 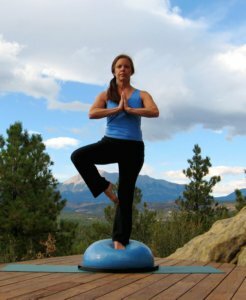 If you are able to do a better Tree Pose on your Bosu Balance Trainer and go deeper in your balance training, please send me a picture through the form below and share your prowess with everyone! It is really hard! We’d love to be inspired and you can create your own web page to show your friends. Scroll down to just do it. Namaste! 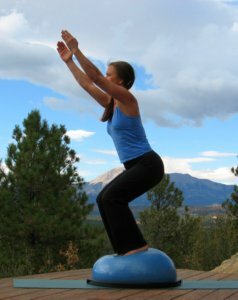 May you find your Power in the Core of Your Being as you do your balance training on your Bosu Ball. And may you find health and healing as you do movements for your soul. Basic yoga poses will always heal your body-mind-soul!